This website is about delivering as much value to you as humanly possible. With that in mind, I have been fiddling with ways to make the website, blog, and tutorials easier to navigate and explore. Blogs are fantastic in that they allow you to get information out fast and furiously... On the other hand, a blog with five years of content and over 1,000 posts can be extremely overwhelming to explore (especially the archives...). This, along with the fact that almost 60% of the daily traffic to this blog is through search engines, have pushed me to make the site a bit less overwhelming. I took some time and really thought about how I could de-clutter the landing page for new and returning visitors. I wanted a well designed, one-page (no scrolling), and minimal landing page. All of the important aspect of the site in one place (social media links, recent blog posts, tutorials page, BIM After Dark links, etc...). Comment below this post and let me know what you think!! I would love to hear your feedback. In addition to the homepage, I have been tweaking other pages within the website over the past few weeks. The old "About" page is now a "Get Started Here!" page. This page will hopefully help new visitors get a feel for the website, content, and navigation. The tutorials page is one of the most visited pages on this blog. I also decided to tweak it a bit (but not too much). If you have not visited the Tutorials page its definitely worth a look (Click here to check it out!). I try my best to break down the easiest way to navigate five years of tutorials! I ran a survey on the blog in the beginning of this year asking what you, the reader, would like to see for the next video series. Unanimously, the vote was for construction documents/documentation. Your wish is my command. Volume 2 is currently in the works. Finally, Volume 3 was the number two most wanted video series voted for by you, the reader! 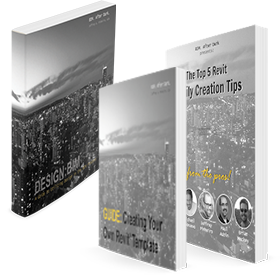 My goal with Volume 3 is to have you laugh every time someone asks you, "can you make that in Revit??!" I firmly believe that you can may ANYTHING in Revit... Volume 3 will give you the techniques to believe it too. I know this was a fairly long post but I hope you are as excited as I am for whats to come! Make sure you check out all of the new tweaks on the site and the new homepage. Feel free to email me or comment below about anything and everything! Cheers to the next five years!